No matter what method is being taught to a child, the parents still play a key role in that child’s success. As a teacher, I teach Suzuki method with my youngest and beginning students. I stress the parents’ role from the beginning. One or both parents must be involved in a child’s musical development from the very beginning, especially if that child is very young (say, up to 11 or 12 years old). Obviously, all students need positive encouragement. That is a given. Below are some additional ways to motivate a violin student. Also, I will show that a parent’s role changes as their child ages. This is important to remember because as a child gets older, he or she will resist any help from mom or dad. Also, moms and dads will need to tailor the advice below to their own child’s needs. No method of violin teaching is perfect, and no method of parenting is perfect either. Enjoy! At what age should a child begin violin lessons? I am asked that almost daily. Some teachers agree with me and others don’t. Personally, I prefer to start kids on the violin at age 5 and up. 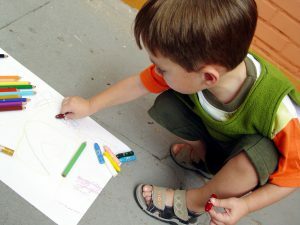 Do I think teaching 3-year-olds is a waste of time? Absolutely not. But, in my opinion, five is the best age to start. Why? Because a child has already been exposed to a basic sense of structure and rules in his life. At 5 years old, a child is probably in kindergarten which means he has been through pre-school and pre-k. He knows that he has to listen to the adult instructor. Also, a 5-year-old probably knows his numbers up to 10 and the alphabet. Both are necessary to learning music. I encourage any parent to learn along with his or her child. Sometimes mommy or daddy rents an instrument too and takes lessons with the child. This is a terrific way to be involved with a child’s musical progress, but not mandatory. When I say that parents should learn also, I mean they should know what the child knows. If they are putting that knowledge to use with the violin in hand, so be it. At the very least, a parent should know the note names, rhythms, and violin anatomy just like the child will learn at the beginning. I direct about 50% of teaching to a parent so they can guide the child at home during the week. When I taught instrumental music in the public schools, I did not have a music education degree. I had not taken the method classes (learned all instruments) that music ed. majors take in school. Although I was perfectly qualified to teach string music, I did not have any experience on cello or bass. So, I did the same learning my students did (on cello and bass) and stayed a chapter or two ahead of them the entire year. By the end of the year, I was adept enough at those instruments to teach it through middle school. I encourage all parents to do basically the same thing. There are two types of teachers; the best friend and the tyrant. Which is best? Well, both have good points and bad. Best friends get lots of smiles and they try to catch lots of flies with honey. Tyrants get their flies with vinegar and get results through fear and noise. While tyrants may achieve positive results at first, my opinion is their shtick wears off eventually and all the yelling (bullying?) becomes less effective over time. A teacher who is a best friend has to make sure he doesn’t let students get away with anything, but if a best friend can add just a hint of tyrant, he will be the best teacher. The same goes for parenting. With the youngest students, parents need to practice the age-old carrot and stick policy. Young students should get a reward for working hard at home. They should also fear some sort of punishment for not practicing or not giving enough effort. In today’s world, the loss of TV or Xbox privileges is enough to get a student moving in the right direction. Parents and teachers should also think long-term with musical goals and have a large reward waiting. Something like a trip to Chuck-E-Cheese or Build-a-Bear if they get to the next Suzuki book by the end of the year. As a parent, I hate Chuck-E-Cheese with the fire of a dying sun, but it sure is a great motivator for kids! In the 21st century, pre-teens (9-13) are a tough crowd. Kids at this age are smart, and smart-asses. Assuming a child started learning violin as a youngster, he or she will be more advanced than most parents can follow at this point in a musical education. From here on, a parent’s job is more motivational than side-by-side learning. As a teacher, I enjoy this age of student because the student can be told why he needs to do things a certain way. On the other hand, I despise this age of student because unless I tell them why (and it makes good sense), they won’t do it. They won’t do it on sheer principle. Oh the joys of middle-school education. If a parent can balance carrot and stick successfully at this age, then he or she is going to be very happy with the results. The good news is, at this age, there are more things valuable to the child that can be taken away when he acts up. The “stick” is used a lot more here. The “carrot” is very different though, and this is where the child’s age can be usable. When a 12-year-old can see progress and the fruits of practicing well, they will be more likely to continue to work hard. For many at this age, this is all they need to continue to work. Also, make sure as a parent you attend lessons regularly rather than just wait in the car. You need to know what the teacher is expecting and you can’t trust your child to be 100% truthful when it comes to assignments. Finally, this is the age at which distractions (boys, girls, sports, etc.) start to creep in. Choices must be made, and if one of those choices is to abandon private violin lessons, than so be it. I have flat out told students that they are wasting my time and their parents’ money. I hate to lose students, but sometimes we need to cut our losses and move on. You might call this age the make it or break it years. Ah, high school. There is a reason so many movies, books, and TV shows focus on this period in a child’s life. It is filled with tremendous highs and catastrophic lows. It is also filled with distractions galore. Dating, sports, football games (as a player or fan), exams, college applications, bullying, nerds, jocks, popular kids, and burn-outs. There is no other time in a person’s life quite like it, both good and bad. There is good news. If a child is still playing the violin at this point, he is certainly a more advanced student which is normally a dream for a violin teacher. An advanced student might have plans for college (music major?) that will motivate him or her to practice both hard and well. A logical explanation of techniques is all a student at this age needs to accept an assignment. Unfortunately, that is about where the good news ends. High-schoolers are traditionally ornery and defiant. Depression, anxiety, and all the accompanying symptoms run rampant here. Teenagers at this age are so impressionable, especially to cult-ish fads and crazy ideas. Parents should be vigilant, tough, but also understanding. We were all kids once, yes? I was in 11th grade when The Breakfast Club was released. That film IS my high school (not literally, although it was filmed at the now-defunct high school I would have attended if I still lived in Chicago at that time). A little compassion sprinkled with toughness is what is needed here. The carrot and stick still apply. Be careful though. Teens are smart. They can often tell when a parent is using some sort of technique on them. In my own parenting (my oldest is 10 as of this writing), I prefer simplicity. You do this, you get that. Good and bad. My wife doesn’t always agree, but I am pretty old fashioned when it comes to discipline. Kids need to earn privileges. Kids are driving now. Taking away the car is about the worst thing that can happen to a 17-year-old. Earning Friday nights with the car is very motivational. I had to. On the other hand, rewards are great too. You got an “A” in algebra (something I never could say)? Cool! Here’s 20 bucks for gas. Made the all-state orchestra? Outstanding! Here’s an iTunes gift card. Practiced 10 hours this week? Way to go! Here’s Six Flags tickets. Got into your first choice music school? You earned it! Let’s get you a new fiddle. High school is where long-term goals come to fruition (unfortunately rhymes with ‘tuition’). These long term goals are what parents can use to motivate kids all along, but in high school, the students can see the finish line making motivation easier. One thing that teens love is to be thought of as adults. They love independence. Give them some room and let them be their own boss when it comes to violin lessons. Check in once and a while with the teacher, but otherwise let the student be on their own. A whiff of independence is all some teens need to spring into action. Parenting a music student can be a fun experience. It is not without stress and work. Lessons cost money. The better the student, the better the teacher. The better the teacher, the higher the cost. It isn’t uncommon for lessons with a well-known teacher to cost north of $100 per hour. When starting private lessons, parents need to be aware of how this cost will effect the budget. In addition, there are other financial considerations. A good violin for an advanced student can cost thousands of dollars. There are summer camps, field trips, concerts, and traveling for all-state and other youth orchestras. There is a definite financial commitment. Additionally, there is a time commitment. Playing the violin at a high level means giving up other activities. A parent must make a decision along with his or her child as to how serious music lessons are in your life. Parents love raising a well-rounded child. The negative of this is, the child is not “great” at any one thing. 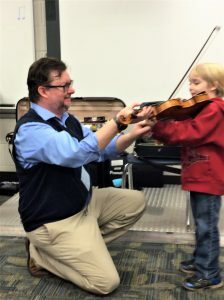 If a child is to be a serious violin student with a career as a musician in mind, then that child has to focus on music and leave other things like sports or theater behind. If a child is learning violin as a hobby or side activity, then that focus isn’t necessary. Decisions have to be made. For me, I made that decision as I entered high school which is pretty early. Results vary. I’m not a parenting expert. I’m not a child psychologist. My degree is in music. This article is not intended to be a guide to parenting. The purpose is to help parents help their children be successful at learning the violin. 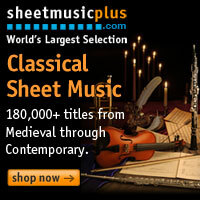 I welcome comments and suggestions and I wish you all the best of luck in your musical journey.